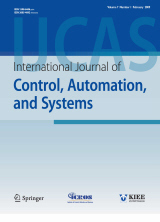 Abstract : "This paper presents a robust nonlinear output feedback control method that achieves three degree of freedom (3-DOF) attitude trajectory tracking of a hover system test bed. The proposed control method formally incorporates dynamic model uncertainty in addition to test bed voltage constraints. To reduce the computational requirement in the closed-loop system, constant feedforward estimates of the input-multiplicative parametric uncertainty are utilized in lieu of adaptive parameter estimates. To eliminate the need for angular rate measurements, the control design employs a bank of dynamic filters, which operates as a velocity estimator in the closed-loop system. A rigorous error system development and Lyapunov-based stability analysis are presented to prove asymptotic 3-DOF attitude trajectory tracking control. Computer simulation and experimental results are also included to illustrate the performance of the attitude control method using the Quanser 3-DOF hover system test bed." Keyword : Output feedback, quadrotor, quaternion, robust, tracking.